Anyone who has lost many or all of their teeth, or whose teeth are diseased, needs dentures. Not only do they provide you with a beautiful smile, they provide structural support for the jaw and help you to speak more clearly. They’re also necessary for chewing. With proper maintenance, your dentures can last for decades, which makes them a good investment in your overall health. What Are My Options for Receiving Dentures? Dentures are available for almost any need, lifestyle, and preference. Your dentist will work with you to provide you the affordable quality dentures that will suit you best. If most or all of your teeth are missing or if they’re diseased, a full denture set may be the best option for you. A full denture will replace all the teeth in your jaws with artificial teeth that are embedded in an artificial gum. The removable denture will rest atop your gums and must be removed daily for cleaning. If you’ve selected a fixed full denture, it will be affixed to the implants. If you have most of your teeth and they are in good health, then a partial may help you. A partial is similar to a bridge except the bridge is a fixed installation whereas the partial is removable and will need to be cleaned each night. A flexible partial and its clasps are made of a lightweight material that moves as your mouth moves. Since the flexible partial and clasps are gum colored, they blend in better with your natural teeth. What Is an Implant-Supported Denture and Why Is it Used? An implant-supported denture is held in place by dental implants and is usually installed only in the lower jaw since the upper jaw doesn’t require as much stability when securing dentures. This is a removable device and will need to be taken out and cleaned each day. 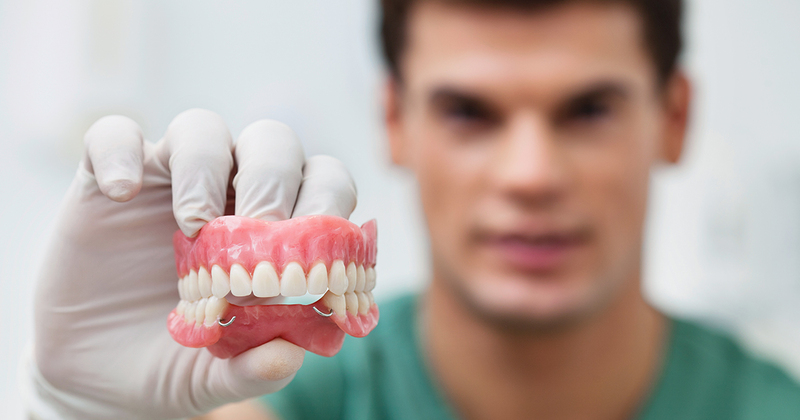 Do I Need an All-on-Four Denture? All-on-Four dentures are a complete set of teeth that are permanently affixed to four dental implants, and usually only in the lower jaw. This is a unique type of denture and combines convenience with increased biting power over that of traditional dentures. Getting dentures in Allentown is a multi-step procedure depending on the type of denture you’ve selected and the options you want. Your dentist will take measurements and impressions of your teeth so that your new dentures will accurately replicate your natural teeth. Extractions will then be made and implants installed if applicable. You’ll be provided a temporary denture to wear while your gums heal and then your new dentures will be installed and adjusted for the best fit and function possible. How Much Will My Dentures Cost at Your Dental Practice? The cost of your new dentures will depend on the type of denture you’ve selected, the materials required to make it, and the amount of prep work that needs to be done. Your dentist will work with you to ensure you get affordable quality dentures for your needs and preferences. Traditional dentures are lined with a hard acrylic substance. A soft reline uses a pliable substance to reline the denture so that it’s more comfortable. Some wearers say a soft reline eliminates painful sore spots. If you want to get new dentures in Allentown, give us a call and we’ll schedule an appointment for you. We’ll make sure you get quality, custom-crafted dentures so you can show off your beautiful smile once again.